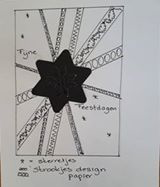 Sketch: A star and washi tape. 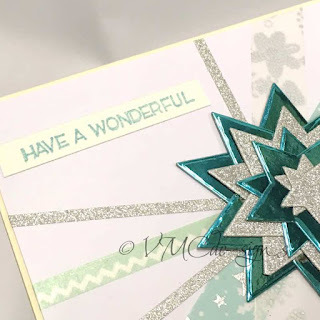 The past months you have seen several creations made with a sketch to work from, well it’s that time again, this time we had to use a star and washi tape. But first I want to wish everybody a happy new year, I hope this year will bring you all good health, joy and happiness. Also I want to thank you all for visiting my blog and website the past year. 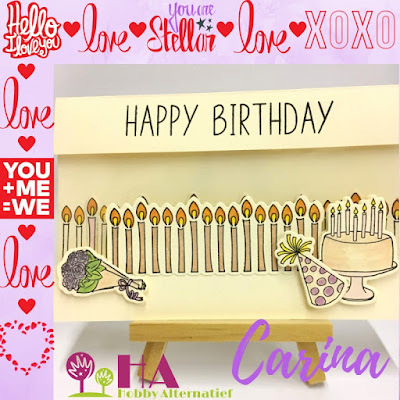 The card I made for this week is easy to make so even a beginner can make it, apart from looking for all the materials so the colours matched it only took me about half an hour. 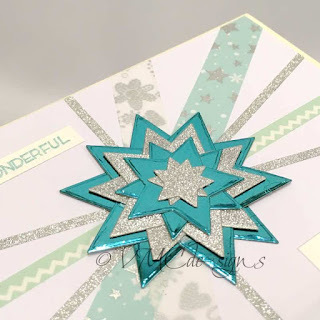 I have build the star with several layers of teal mirror and silver glitter card stock, I have cut every size of the star twice and stacked them all together to create a nice and full star which I then glued on top of the washi tape I taped on the white mat. Tip! When using glitter card stock make sure to use a good glue and put something heavier on top to let it dry. Feel free to leave a comment here, on my other blog or on the posts of the other DT members. It is highly appreciated. This weeks assignment for Hobby Alternatief was “pebble art stone” we didn’t have to use the real pebble stones, we where allowed to make some. So I went to look for an alternative. Finally I choose to make this pendant. But let me start at the beginning. At first I wanted to buy some stone art clay, but forgot that I would have to use my hand working with it. Sadly my hand hasn’t healed enough yet for this kind of work. 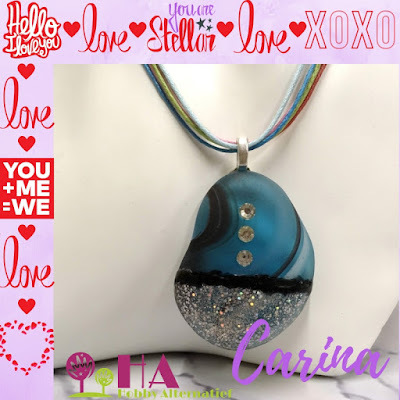 So I had to think of something new and I remembered that I had a few big glass deco pebbles somewhere from when I made jewelry. Sadly I didn’t have enough of them to make them into a framed art piece. So I went looking for my silver plated wires, again i forgot about my hand. Wire wrapping would be even more of a strain on it. Somehow I keep forgetting that.*sigh. So I had to look for other options again. I finally choose to make it the way it is now. Hello again, I’m a bit later then usually with translating my blogpost. I just spend the weekend in a small house on a vacation park with the other ladies from the design team from Hobby Alternatief, sadly 2 of them couldn’t make it. For this week I had to use Mica in my creation, which I don’t have so I went for an alternative. 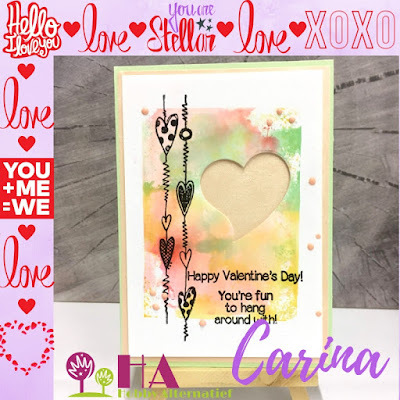 My Valentine card, this weeks assignment for Hobby Alternatief came by coincidence, when I see techniques on the internet I always give them a go and mostly I have no clue what to do with all these trial runs, so I keep them all in a binder and every once in a while when I need or want a unique background I pick one from them. Do you guys keep your trail runs too? Where do you keep them? do you have a binder too, or do you keep them in a box or drawer? I used glossy photo paper for the background and I started with stamping 3 colours random on an acrylic block, then I sprayed some rubbing alcohol the ink and waited for the colours to mix a bit. I pressed the block with the ink facing down on the photo paper. You don’t need to keep the block down for long because the ink is dry very quickly. Tip! When you start with the lightest colour you don’t have to worry much that the ink pads contaminate each other. © 2018 VMCdesigns. All Rights Reserved.